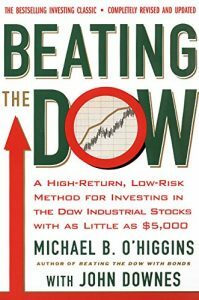 Dogs of the Dow theory, used as an investment strategy, was first popularized by Michael O’Higgins in his book Beating the Dow, which was published back in 1992. The theory is based on the purchase of high dividend yield stocks that are members of the Dow Jones Industrial Average. The strategy’s simplicity is one of its most attractive attributes. The Dogs of the Dow are the 10 of the 30 companies in the Dow Jones Industrial Average (DJIA) with the highest dividend yield. In the Dogs of the Dow strategy, the investor shuffles around his or her portfolio, adjusting it so that it is always equally allocated in each of these 10 stocks.